The Blackjack Lite Hawk has been designed for both civilian and para military use. 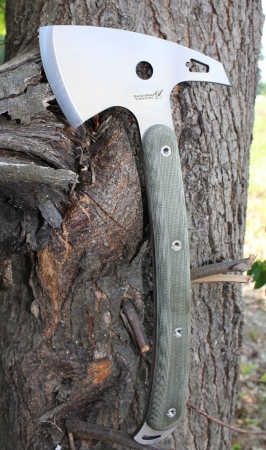 This crash/entry axe has plenty of forward weight for effective cuts and chops and is light enough to easily pack and carry. The full length handle scales allow the user to adjust his grip for using the razor sharp head for cutting tasks or full power swings for effective chopping. Each Blackjack Lite Hawk is supplied with a leather sheath to protect the blade. Proudly made in the USA.